The second sock, in a knitted pair, carries a curse. 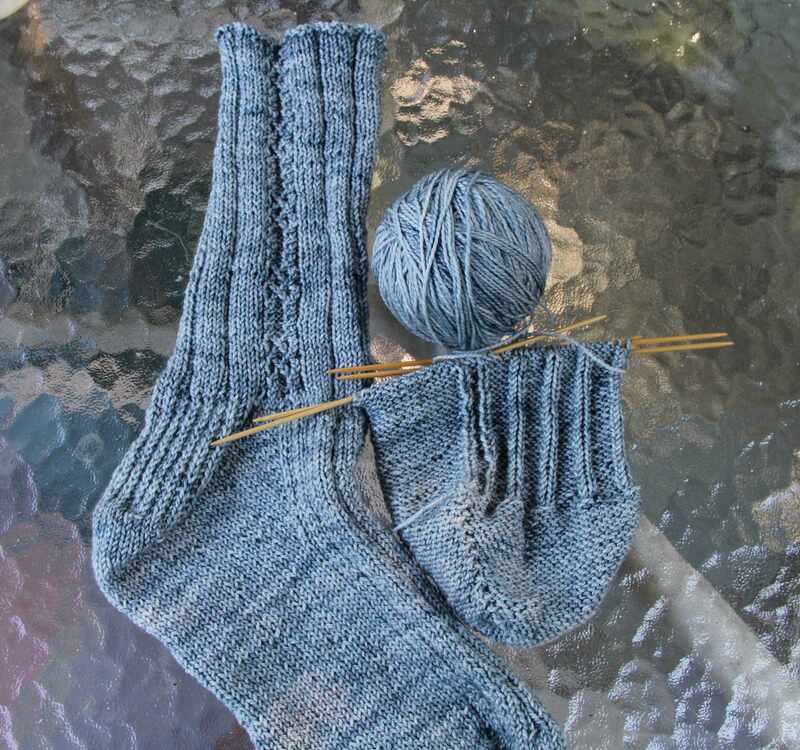 For me, the curse is anything that can go wrong will go wrong when knitting the second sock. It’s why I like to quietly cast on my tiny stitches for the second sock with no announcement or fanfare and knit it as discreetly as possible, hiding it under other knitting when putting it away for the evening, in short doing everything I can not to catch the attention of the knitting-powers-that-be and hopefully skirt the curse. Instead I made a gruesome error. I inhaled sharply as if I had suffered a severe paper cut. He didn’t say that, I thought to myself, tell me he didn’t say that. I could feel the attention of the knitting-powers-that-be rivet onto me, taking in my tiny, pathetic sock needles and the innocent ball of yarn awaiting cast on as the second sock. I closed my eyes and practiced deep breathing for the next 10 seconds and tried to accept that the second sock would be a hellion. No sense in chastising The Skipper. The man isn’t superstitious in the least. If I had explained the curse, he would dismiss it as irrational. Yes, irrational to him, but he wasn’t the one who would struggle to knit through the curse. I have restarted the sock twice. Despite the progress shown in the picture above, I will most likely be ripping it back for a third time as I don’t like the way the short rows look on the two initial right side rows that begin the toe shaping. I am going to give the toe a little soak today to see if it blocks out. I know that it won’t. On a positive note, I ordered yarn to begin a small shawl that I have wanted to knit for months. If I am lucky, the yarn will be in today’s post and I will cast on for the shawl while the wretched sock dries. If I’m really, really, lucky it will take the entire weekend for the thing to dry. Have you tried knitting two at a time? I love it for the same reasons you just now mention. Any mistakes on one means both sox are mistakenly the same, therefore are not really mistakes, but rather are “planned” anomalies. Ahem! I don’t have 2nd sock syndrome so much, touch wood (or sock?) But I speak as a terminal vanilla sock knitter, so not so much margin for error perhaps! I haven’t tried knitting two at a time yet. I keep promising myself to try it, but haven’t. You are smiled upon by the knitting-powers-that be. I have had even vanilla socks going very wrong in the second knitting. You need circular needle set, fairly long and thin cable. It is easier with just one, imho. One long circular needle with two socks on it has intimidated me for awhile now. I can envision the unending number of ways of messing that up. But at some point I may have to give it a try. Yes, that was what I was thinking. A sacrificial bit of merino yarn offered to Yarn Rascal as an appeasement to the knitting gods. He would be extremely delighted. I can only hope the knitting-powers-that-be would appreciate it. I understand your pain. On Sock One you knit but on Sock Two you have to Match. That’s tricky with non-striping yarn. Because I like to wear my socks with Mary Janes (T-bar shoes) I extend the pattern over the top of the sock. This helps with counting and getting equally-sized socks. The only way you could mess it up is if you didn’t Chang your yarn when you work on the second sock. In which case you either dunk it out one stich at a time, out you frog the whole thing .. very much like you’ve already done with your cursed second sock. It is all good. There are good videos out there. Let me know if I should recommend one. How about this? You take some yam, and a set of thin-cable circular needle, and make a practice run at it, knowing you will frog it. Going at it that way takes the punch out if your fear. Because it is not a deal piece of knitting. Yes, great idea. Equally sized for all sock parts is a challenge with the second sock, especially when I’ve accidentally tossed the paper with the specific notations of when to start the gusset. I like that approach of a practice run. I may do that tomorrow. Search youtube and see what I come up with. Thanks. oh dear. I hope the shawl yarn arrived, and that you set the sock out in the rain to dry. 🙂 Isn’t it odd how you can do something exactly the same way, and it does not come out the same? Very frustrating. I hope the sock straightens itself out and the shawl is a joy. I have done two at a time – it works well with the right pattern – don’t try it with the business casual pattern though, as there are times when you have to move stitches from the front needle to the back, and that is rough with two at a time. Having learned that lesson the hard way, I can say I do like it for some patterns. Progress feels slow, but suddenly you have two socks done. The shawl yarn arrived. Meanwhile the sock sits there like a giant rebuke. nah, like a project that requires time out. Just make sure it’s at least 50g! And by the way I spoke too soon about vanilla socks. Didn’t CO enough stitches and had to start over!